Nobody denies the benefits of having a successful blog. Create and distribute content in a way that attracts interested prospects and turns them into leads. Instead, the problem usually falls on actually creating that blog content when you’re starved for time. If you’re a hyper-busy small business owner or marketer, the thought of feeding your blog can be an overwhelming initiative. That is, until you follow the 5-Step Blog Jumpstart Plan. A plan that guarantees your blog is actually serving a function – say it with me now, “intentional content”. Now burn that phrase into your brain. Instead of publishing posts that don’t really do anything, this process will help you to create and distribute content in a way that attracts interested prospects and turns them into leads. Is The 5-Step Blog Jumpstart Plan for You? Before I dive into what this jumpstart plan is and how to do it, you need to make sure this plan applies to your business. The goal of the 5-Step Blog Jumpstart Plan is to get started creating (or growing) your blog in a way that’s both highly effective AND time-efficient—not to aid you in (multiple) daily post creation. In other words, is your business model selling ads to monetize the traffic coming to your site? Remember, just because you publish posts doesn’t make you a publisher. You’re only a publisher if your business model is selling ads on your content. If that’s the case, then the 5-Step Blog Jumpstart Plan is not for you. Because if you’re a publisher, then the volume of content you create matters. A publisher’s revenue is directly tied to how much new content they push out. Websites like HuffPost will publish anywhere from 6-12 articles per day. Some businesses prefer not to spend money on traffic and rely only on “free” organic traffic. If this is the case, then the 5-Step Blog Jumpstart Plan isn’t for you. Second, when you’re relying solely on organic traffic to bring people to your site, volume once again becomes really important. 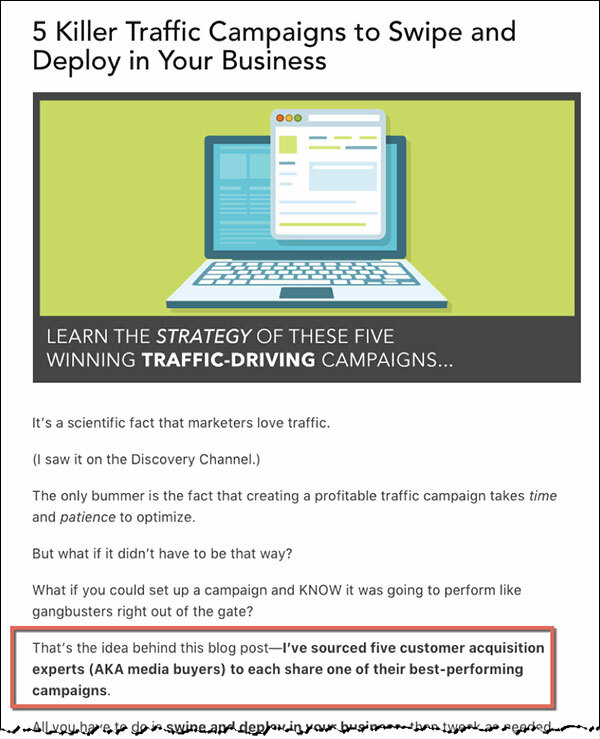 Because the best way to bring in a bunch of organic traffic is to create a bunch of blog posts. And with the 5-Step Blog Jumpstart Plan, you don’t need to create a lot of posts on a daily or weekly basis. The 5-Step Blog Jumpstart Plan is a method you can use to build (or grow) a successful blog without having to write multiple blog posts every day or week. But it won’t work for publishers or people who are only interested in organic traffic because, by their very definition, those two things require a high amount of volume (in other words, publishing lots and lots of blog posts). 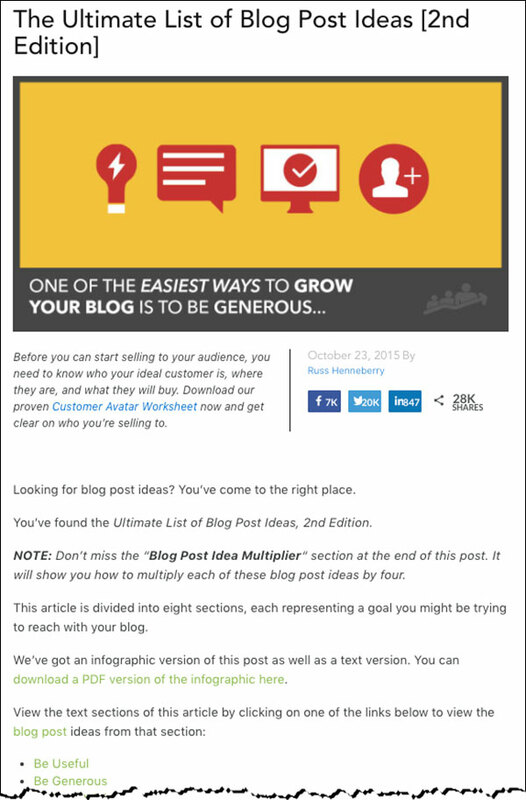 Now without further ado, here is your five-step plan to jumpstart your blog. Keep in mind that this plan will work whether you’re launching a brand-new blog, or just trying to give you existing blog a serious boost in performance. Forget posting three times a week or anything like that. The first thing I want you to do is simply create ONE post. But this blog post needs to be good. No, great. A couple hundred random words of content is not going to cut it here. I want you to spend the same amount of time you would normally take to write 3-5 blog posts and use that time to make sure this is a fantastic article that’s insightful, well-researched, and clearly written. Please note that I’m not suggesting that you write a list post. I’m suggesting you write a BOHLP—a big old honkin’ list post. This is not one of those quick “Top 10 Reasons Everybody Should…” type of posts. Instead, this should be a long, well-researched post with plenty of examples, pictures, case studies, and so on. But 332 different ideas for writing a blog post. The first iteration of that blog post took us three days to create, and over the years we’ve continued to tweak and improve it. Right now, it stands around 3,421 words (longer than this post 😉 ). It’s attracted many thousands of organic visitors, and we also buy traffic to this post because we know it attracts a good prospect for us. Instead of taking the time to create that one huge post, we could have written 5-10 smaller, less thorough posts. But you know what? Those articles probably would have been far less effective than that great big post, and they almost certainly wouldn’t still be bringing us new traffic and leads today. How-to posts have always worked. They work today, they worked yesterday, and they’ll work tomorrow. After all, people want to know how to do stuff! That’s a big part of why we go online in the first place. Keep in mind, however, that the internet has gotten saturated with how-to posts over the years. Google anything that starts with the phrase “how to” —how to put up a tent, how to fold a newspaper, how to roll up your sleeves—and you’ll find a bunch of articles already published on the topic. Does that mean you can’t find success with a how-to post? In short: your how-to post has to be better than every other competing post on the topic. If you can do that, then your awesome how-to post will be a great way to position yourself as an authority in your industry. Out of the four blog post types I’m recommending, this is probably the one that’s the least commonly used. But make no mistake: crowdsourced posts like this can be some of the best-performing articles online! You’re generating highly relevant content by interviewing well-known experts in your industry. First, create a list of seven experts in your industry. The more “expert” they are, the better. Then think of three good questions to ask each of them. Make sure the questions are at least slightly controversial, so everyone will have a different answer to all three questions. Now reach out to your list of people and ask them your questions. 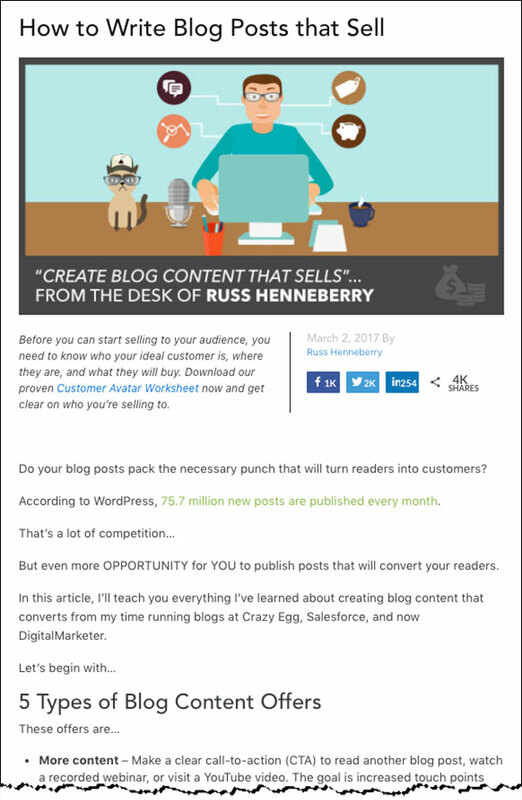 Once you get everyone’s answers, you’ll have all the content you need to write a great big blog post that’s just dripping with authority. Realize there’s nothing magic about the “7×3” part of the formula. If you want, you could ask seven questions to three different experts and achieve the same thing. Or ask four questions to five experts. And so on. The important thing to remember is that you’re generating highly relevant content by interviewing well-known experts in your industry. If you want to see an example of this type of post, check out this post. Tip #1: Don’t scare new experts away by asking them to “write a blog post” for you. Instead, stroke their ego by asking to “interview” them. Writing a blog post sounds like work. Being interviewed sounds like something that happens to people who are famous and important. Tip #2: Once you’ve got one expert to answer your questions, name-drop that person when you approach other experts. Then, approaching Expert #3 will be even easier when you can say you’ve already got feedback from Experts #1 and #2. Remember that experts want to be associated with other experts. Leverage this whenever you can. Tip #3: Audio is your friend. If one or more of your experts doesn’t have time to write out answers to your questions, give them the option of a short interview (there’s Tip #1 again) instead. Just about everyone can agree to a quick phone call: it’s fast, easy, and not the least bit intimidating. And as long as you ask good questions, let the expert do the talking, and record the call, you should get all the content you need. Remember: people get writer’s block. Nobody gets talker’s block. Tip #4: Avoid using old quotes. Instead, acquire new and unique content. Why do I have to interview people? Can’t I just find things my experts have said in the past and use those old quotes in my post? And the answer…technically speaking…is yes, you could. But the problem with doing that is that you are likely rehashing old quotes and advice that your readers have seen a hundred times already. Instead, you want your content to be NEW. Exciting. Unique. Something they’ve never read before. That’s how you get visitors to stick around and actually read your content. Tip #5: Never offer to pay people for their feedback. Instead, you’re offering something even more valuable: exposure, traffic, and credibility. Real experts don’t care about getting paid $5, $20, or $50 for a few minutes of their time. But they DO care about getting their name out there and building more credibility and authority. Instead of offering them money, tell them you will link back to their website in your post (bringing them traffic) and that their answers will be seen alongside other industry pros (increasing credibility). Use these tips and you might be surprised at the experts you’re able to get featured on your blog. Just go through your analytics, find your best-performing post, and use that for the 5-Step Blog Jumpstart Plan. If you have an article that has performed well in both social and email traffic (say it generated a lot of social shares and had your highest click-through rate (CTR) from email), that’s a good sign that you hit on a good hook in that blog post. If you have a post like this, then there’s no need to write any new articles just yet. Simply use the great content you already have for the remaining steps of the Blog Jumpstart Plan. Now that you’ve got a really high-quality article, your next step is to turn that article into what we call a Lead Magnet. A Lead Magnet is basically a free resource that you give away to people in exchange for joining your email list. If you’re not sure how to do this, I recommend checking out a tool called Designrr. It really simplifies the process of creating downloads and other online resources. Then you’ll need to create what we call a squeeze page. This is basically a short and simple landing page that gives visitors the option to sign up for your email list in exchange for free access to your Lead Magnet. If you don’t have a good way of creating a squeeze page on your website, get a tool like InstaPage and use one of their lead-generation templates. 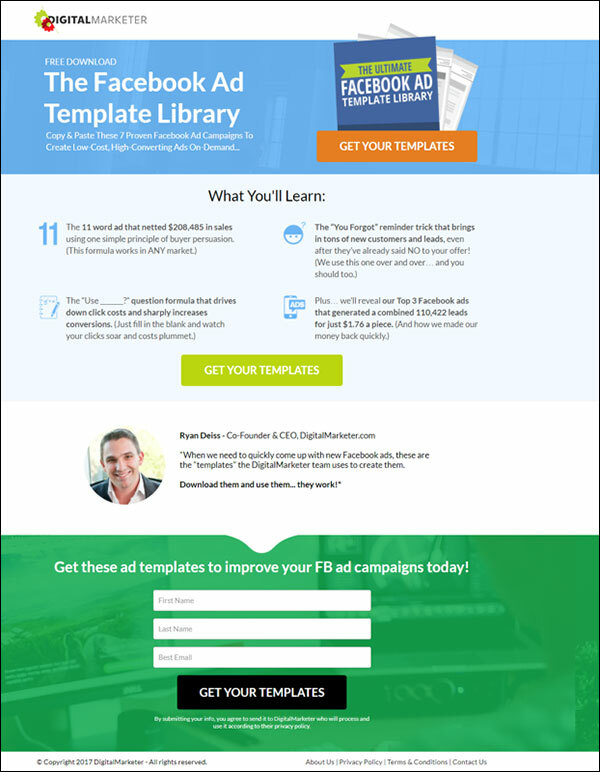 It’s a super quick and easy way to make high-converting new landing pages. Finally, you’ll need to integrate the landing page with your Email Service Provider (MailChimp, AWeber, Active Campaign, etc. ), and set it up so that anyone who signs up for your email list through this squeeze page will automatically receive your resource in their email. Here’s where things get exciting because we’re about to start sending traffic to your website! There are a TON of different ways you can buy traffic to your article. But for the sake of simplicity and effectiveness, I highly recommend starting out with a boosted post on Facebook. You don’t have to spend a fortune here. You can start with just $10 or $20 and see how people react before sending more traffic. Next, you want to retarget anyone who read your article and serve them an ad for your Lead Magnet. 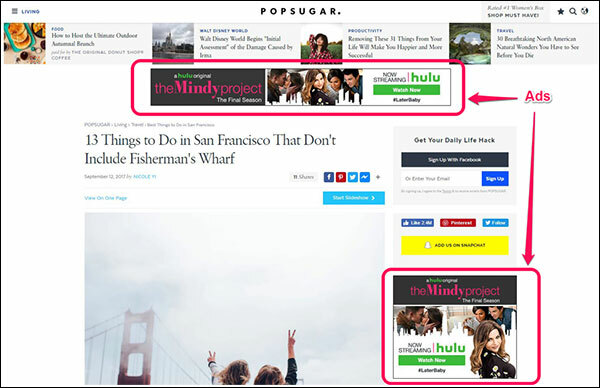 …so, you can show them an ad that takes them to your squeeze page. The idea here is that you’re first showing people a super-high-quality blog post that should engage them and start to position you as an authority in your niche. Then you retarget them with a Lead Magnet on the same topic (because you already know they’re interested in it). The result should be a retargeting ad with high CTR and a landing page with a high conversion rate. Lots of new subscribers (AKA leads) joining your email list! Because it doesn’t just build a blog for the sake of building a blog. Instead, it’s a way of creating and distributing your content in a way that attracts interested prospects and turns them into leads! A person is on Facebook. They click on your boosted post and go to your article. Later, they click on your retargeting ad and go your landing page. Then, they join your email list and become a lead! Once a new lead is on your email list, you’ll be able to follow up with them regularly. You can send them to all your new blog posts (helping to grow your blog even further), and more importantly, nurture them until they make a purchase and become a new customer. Now, what’s the next step? Do it again! Create another article or choose your second-best-performing blog post that already exists and repeat the process over again. Do this every time you create a new blog post, and you’ll start to see more and more leads coming into your business. Keep in mind, you don’t have to do this every single day or even every single week. If all you can manage is 1-2 new posts per month, that’s fine to get started. In fact, publishing 1-2 awesome new articles using this jumpstart plan is much better than creating 5-10 hastily written blog posts that never really do anything. You now have an effective five-step process you can use to jumpstart a new blog or grow an existing one…all while generating leads and sales for your business. At the same time, I hope the process frees you from the misconception that you have to produce content every single day. If you’re not a publisher, you don’t. Simple is good, guys. Simple makes it easy to take action. Now go out there and take action on your blog!